Better stands. Better yields. Producers will achieve best-in-class emergence in a wide variety of soils and residues. 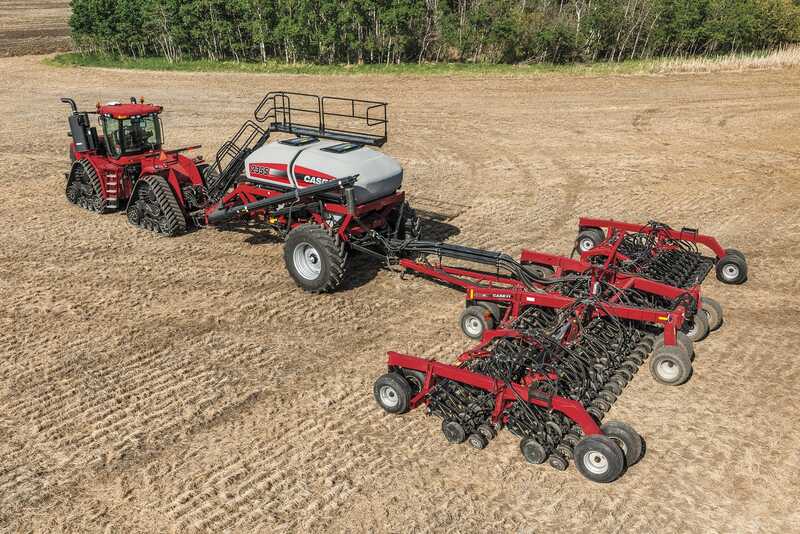 Case IH Precision Disk 500 Air Drills offer the most accurate seed placement available. Ideal for almost every crop and fertilizer type. The primary and secondary runs feature UV resistant flexible PVC with a steel header and EZ-Flow manifold. Ideal for highly abrasive crops like rice. The primary run features 2.5 in diameter flexible PVC hoses, each with a Urethane Liner that resists wear and extends the life of the hose. Optional optical sensors monitor the product flow through the delivery system. Row unit lock up offers the ability to easily split the front and rear ranks to allow seeding with only the front or only the rear rank. Raising the ranks, then rotating either the upper (front rank) or lower (rear rank) pair of valves will prevent the rank from lowering. Rank Lock-up pins whould also be inserted. EZ Flow Header is deigned for easy serviceability and accurate product distribution. A replaceable steel tip on the insert reduces abration effect and prolongs life. Quick access to inspect riser tube and manifold ports. The Precision Disk 500 Disk Drill features can be managed with ease on the AFS Pro 700 monitor. Its convenient, one-page seeding display keeps all the necessary information close at hand. Case IH designed this machine to handle the needs of producers who want to be accurate, efficient and profitable​​. To simplify operation, all of the necessary screens to operate the Precision Disk 500 are all on one page-no need to change screens. ​Learn about the Precison Disk Air Drills Series.